Many thanks for coming to visit us. 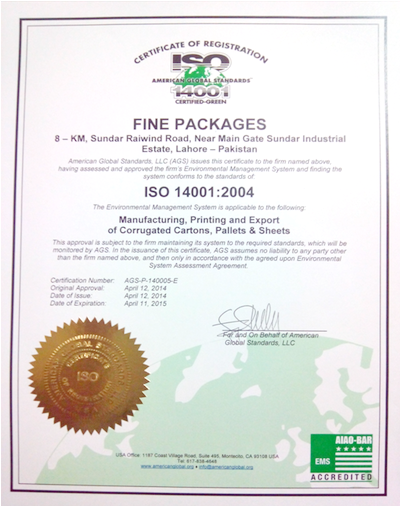 Fine packages is a company to fulfill your all printing and packaging needs. Have a look around the rest of our site too. We can offer you tips on movinghome and buying packaging. we want you to be satisfied with every aspect of your purchase, from the packing materials that we supply, to the information we give, (with regard to the status of your order) to the actual delivery itself. 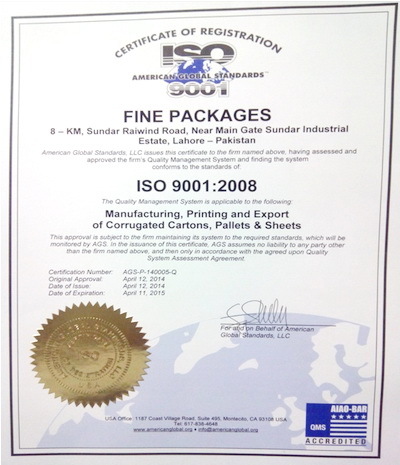 Fine Packages have the distinction to become Pakistan’s first ISO 9001 + 14001 Certified printing and packaging company. We are also the first printing and packaging company providing online ordering and online order status to all the valued customers across the world. • To have satisfied Customers. • To provide value for money. • To be reliable in terms of quality and service.